Black Pearl Divers offers a full range of PADI certified courses for all ages, from beginner to advanced to enhance your Roatan diving experience. Younger kids can begin to get comfortable with diving gear with the Bubble Maker program (ages 8-10), while the 10-99 year old youngsters can do a 1-day Discover Scuba to see how much they like diving, and then continue with their Junior or regular Open Water certification. If you are already certified Open Water then perhaps it is time to become an Advanced Diver or enjoy a couple of specialties such as wreck, night or deep diving! If you haven’t been diving in a while there is nothing to worry about, our quick Refresh Course will have you diving like a pro in a couple of hours! And since no one wants to spend vacation days reading and studying for the dive certifications, PADI’s e-Learning online platform allows you to do all the book work before even setting foot on Roatan, so that once you are here it’s all fun in the Sun! Check out our courses below for diving in Roatan. This is a fun, easy and safe way to introduce children to scuba diving with our Bubble Maker course. They will get the chance to experience what scuba diving is like under the direct care and supervision of a PADI instructor. They will learn in water that is no more than six feet deep in basic scuba gear that is made for their size and stature. Children should be comfortable in the water, but they don’t have to be super swimmers. What better place to learn than in Roatan! (1 day). Plunge into our Discover Scuba course today and experience the incredible dive sites Roatan has to offer. Your PADI instructor will teach you the basics of your scuba diving equipment in shallow water and what it takes to explore the marine world. There is nothing like breathing underwater for the very first time. It takes a little getting used to, but after a few minutes of awestruck wonder, most participants realize how easy scuba diving really is. Learn to scuba dive in open water and your experience may count towards PADI Scuba Diver or Open Water Diver certification. To take this course you must be at least 10 years old. (1 day). Got the urge to become a certified diver? Dive in Roatan towards your PADI Scuba Diver certification. This course builds on your existing scuba knowledge by developing skills like buoyancy techniques, staying warm underwater, preventing common problems underwater and an introduction to boat diving. Dive to a maximum depth of 40 feet / 12 meters. This is an ideal course if you expect to go scuba diving primarily in the company of a dive guide or if you have limited time to devote to scuba certification. Or choose to continue on to our PADI Open Water Diver course. You need to be at least 15 years old to participate or 10 years old for Junior Scuba Diver certification. (2 days). The PADI Open Water Diver course is the world’s most popular scuba course, and has introduced millions of people to the adventurous diving lifestyle. The course consists of three main phases: knowledge development (online, home study or in the classroom); confined water dives to learn basic scuba skills and open water dives to review your skills and explore all Honduras diving has to offer! You will also learn to use basic scuba gear including a dive computer and standard accessories. To enroll in the PADI Open Diver course or Junior Open Water Diver course you must be 10 years or older. (approx. 5 days). Exploration, excitement and experiences. They’re what the PADI Advanced Open Water Diver course is all about. And no, you don’t have to be “advanced” to take it – it’s designed so you can go straight into it after the PADI Open Water Diver course. This course helps you increase your confidence and build your scuba skills so you can become more comfortable in the water. It is a great way to get more dives under your belt while continuing to learn under the supervision of your PADI instructor. Learn underwater navigation, deep water diving (typically anywhere from 60-100 feet/18-30 meters), digital underwater photography, wreck diving, peak performance buoyancy and much more. Talk to an instructor at our dive shop to choose what activities are best for you. To take this course you must be a PADI Open Water Diver and at least 15 years old. (2 days). Begin your scuba certification online where you can complete the classroom portion of the PADI Open Water Diver course at your own pace, anytime, anywhere with PADI eLearning. After you complete all the segments, you can print your eLearning record and bring it to our dive center to start the next phase in your underwater adventure. This course includes the confined and open water dives required for certification. (4-5 days). If flexibility is what you’re looking for then this is the option for you. 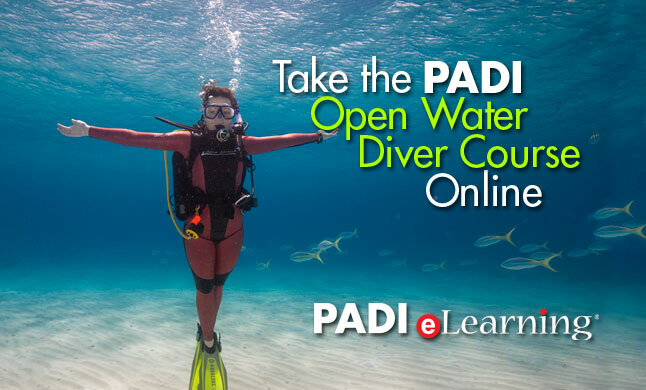 eLearning gives you convenient online access to knowledge development course material for one year and unrestricted access to an online version of the PADI Open Water Diver Manual. Learn at your own pace and on your own schedule. Plus, you have the option to contact our Roatan dive shop with any questions about the coursework. Our qualified instructors will guide you through this process. The minimum age for student divers enrolled in PADI eLearning courses is 10 years old. An eLearner under the age of 13 requires parent or guardian permission to register online. To register please click on the banner below. Prices vary since you can not only do the Open Water course but also choose among others already available online.